Original text by World Animal Protection. Photos by Neil D’Cruze. Alarming footage captured by World Animal Protection and the Wildlife Conservation Research Unit (WildCRU) at University of Oxford reveals the heart-breaking moment a pangolin is brutally killed for its body parts to be sold on the black market in Assam, north-eastern India. Pangolins have become an icon of the illegal wildlife trade in the media, but very little has been shared of the suffering they face. Pangolins are often referred to as the world’s most trafficked mammal and this footage demonstrates the huge cruelty the animals endure when hunted. The harrowing clip is part of a two-year study, conducted by researchers from World Animal Protection and the University of Oxford, into traditional hunting practices in the state of Assam, that borders Bhutan. The study is published in the open-access journal Nature Conservation. Interviews conducted by researchers with over 140 local hunters found that pangolins were largely targeted for their scales that are sold for a premium, with hunters earning the equivalent of four months’ average salary for a single pangolin. The hunters from these communities were clearly unaware of the part they are playing in the international trafficking trade. Yet the illegal traders that then sell the animal products across the borders on the black market go on to make a large profit. Pangolin scales are used in traditional Asian medicine particularly in China and Vietnam. They are made of keratin, the same material that makes human fingernails and hair, and they have no proven medicinal value. Pangolin meat is also considered to be a delicacy in some countries, and the scales are also used as decorations for rituals and jewellery. They are considered to be at high risk of extinction primarily as a result of illegal poaching. “Suffocated with smoke, beaten and boiled alive – this is a terrifying ordeal and pangolins clearly suffer immensely. 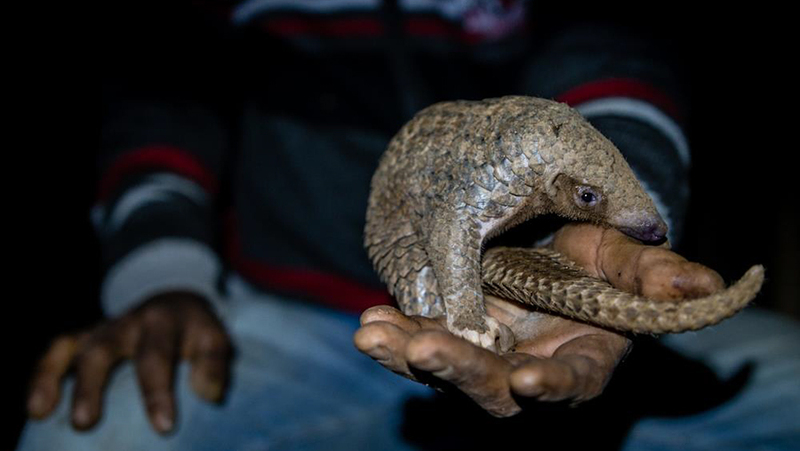 Indian pangolin (Manis crassicaudata) from Northeast India. These shy creatures act as natural pest controllers and reduce the need for toxic insecticides. They also help aerate the soil with their long snouts, tongues and claws as they search for food. Support for alternative livelihoods, alleviation of poverty and education programmes within rural communities wherever pangolins are found globally, to stop the slaughter.